We flew from San Diego to Seattle, rented a Lincoln Towne Car at the airport, and headed east to Idaho while managing to do some sightseeing along the way. As the Conference came to an end, Miguel and I prepared to return to Seattle. I told Miguel I would go get the car and pick him up at the curb at the hotel entrance. Miguel was waiting for me as I pulled up to the curb. At the same time he got into the passenger seat, another conference attendee also entered the car through the rear door. I thought Miguel had invited him, so I didn't say anything. Miguel thought I had invited him, so he didn't say anything either. A couple of blocks down the road, noticing something strange, our absent-minded, would-be intruder said: "Driver, is this the limo?" 1 Ponce, V. M.. 1984. Kinematic shock: Sensitivity analysis. Proceedings, ASCE Hydraulics Division Specialty Conference, Couer D'Alene. Idaho, August 13-17, 880-884. 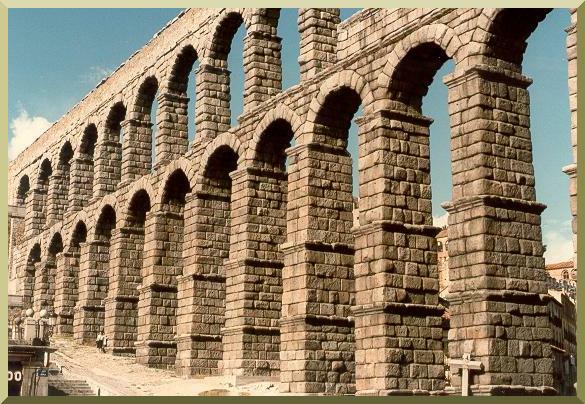 Roman acueduct in Segovia, Spain.